Speaking at the 2nd UK Trouw Pig Nutrition Conference, Dr Pieter Langendijk, Nutreco R&D, explains how the nutrition of the sow during early gestation can effect productivity, writes Stuart Lumb for ThePigSite. As an introduction to his topic, Dr Langedijk reminded his audience of the physiology relating to the breeding female. After fertilisation, embryos secrete oestrogens (days 9-12) which modify the uterine environment and support migration. Embryos then get spaced out (days 12-13). 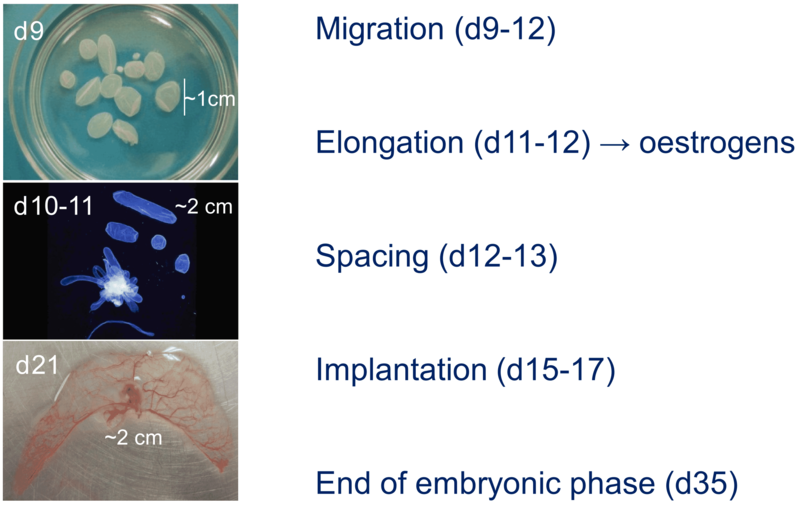 Implantation occurs (days 15-17) with the embryonic phase ending at day 35. Crowding becomes apparent after implantation plus the majority of embryonic loss has occurred by 3 weeks. The Meishan is noted for having very large litters. Meishan embryos develop slower and secrete less oestrogens which may reduce the competition between embryos and help survival. 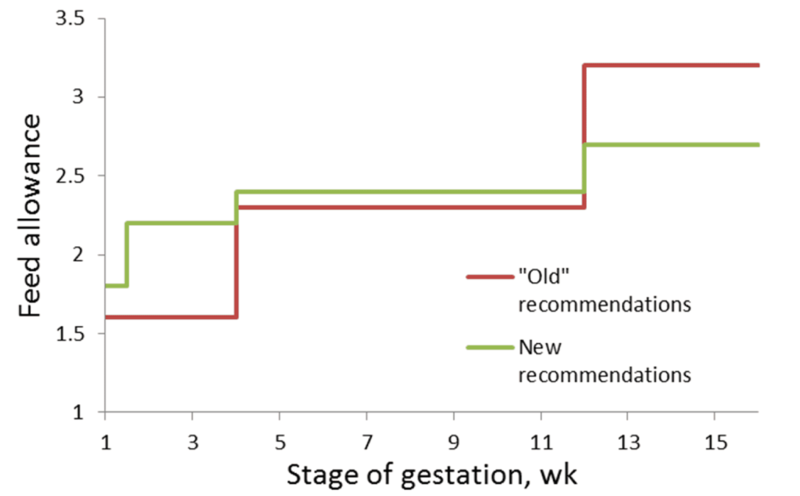 Traditionally it was recommended that feed be kept low after service, but a review of literature does not support the traditional strategy of low feed allowance during the first month of gestation and even supports higher allowances. (“The gestating and lactating sow”. Farmer 2015). Having said that, Jindal (1966) found that high feed levels for the first 3 days after mating reduces embryo survival. This would indicate that feed should be kept low for the first 3 days post-service but is then increased. In fact, low feed levels early in pregnancy can be detrimental to litter size. Gilts when fasted for 36 hours from day 10 had smaller litters than gilts fed normal levels. This has implications in relation to the type of housing system used. Floor feeding is a cheap option, where females are group housed, but bullying can take place and timid females may end up eating insufficient feed, with ramifications regarding the number of piglets in the litter that they eventually produce. Vascularity of the placenta is very important and L – Arginine impacts on this. 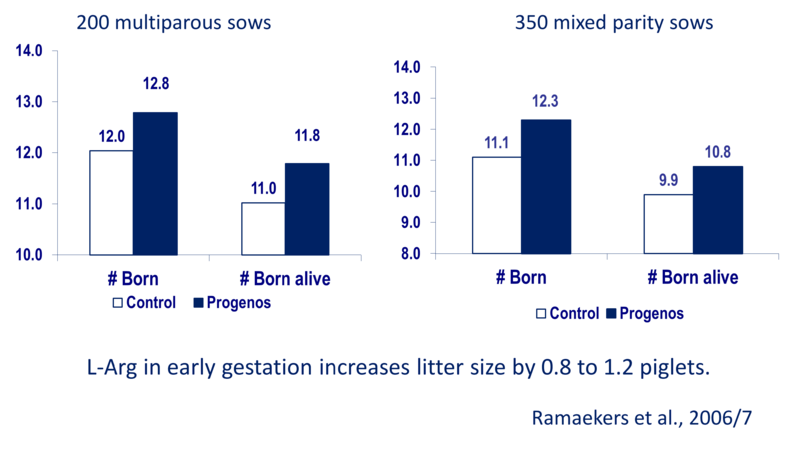 Progenos is a commercial supplement containing L- Arginine and supplementing sows’ feed with Progenos in early gestation increased litter size by 0.8-1.2 piglets. After 3 days post-mating abundant feed is recommended. Be aware of the effects of low feed intake where pregnant sows are group housed. The functional area of the placenta can be increased by nutrition ( L-Arginine). The graph shows how feed recommendations have changed over the years. This is hardly surprising as the hyperprolific sows that producers work with today are a far cry from the sows that were around in the middle of the last century.